An old 1960s building has been brought back to life as a beautiful and contemporary office complex with a low energy footprint. 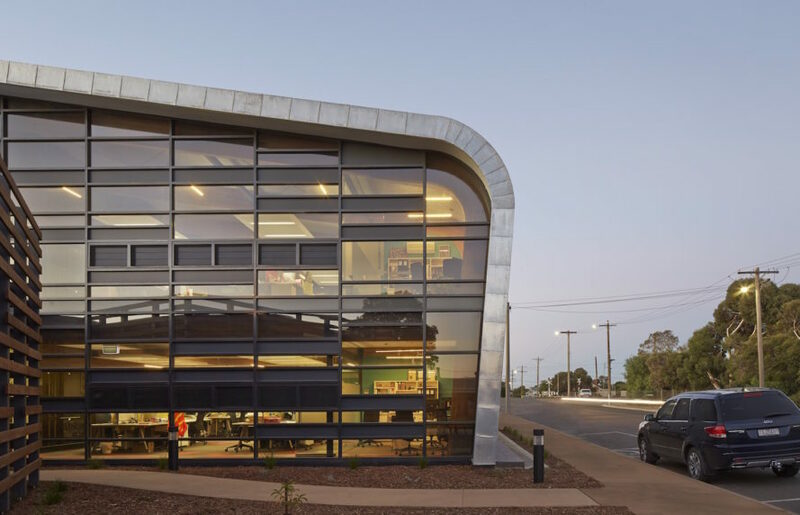 Designed by k20 Architecture, the Hindmarsh Shire Council Offices in the rural Australian town of Nhill was created with a strong focus on sustainability, and it draws inspiration from agricultural elements to reference the local vernacular. The building reused over 80% of its original building materials and it's outfitted with energy-saving and energy-generating systems ranging from solar panels to LED lights. Since the Hindmarsh Shire Council Offices is located in a relatively remote rural location exposed to extreme temperature conditions, the building’s thermal performance was a high-priority design focus. To minimize heating and cooling costs, the building was constructed with an earth pipe heat exchange system and underfloor ventilation plenums to draw in fresh air that’s then cooled, or warmed, naturally by the earth and then distributed through the floor grills to maintain comfortable indoor temperatures. The silo-inspired buildings were constructed with a minimal and locally sourced material palette of Vic Ash timber, steel, and glass, as well as recycled materials from the former building, to reduce the project’s carbon footprint. The offices also incorporate 72 solar panels and LED lighting throughout. Passive solar design, cross-flow ventilation, and zoned motion detecting further minimize energy consumption. 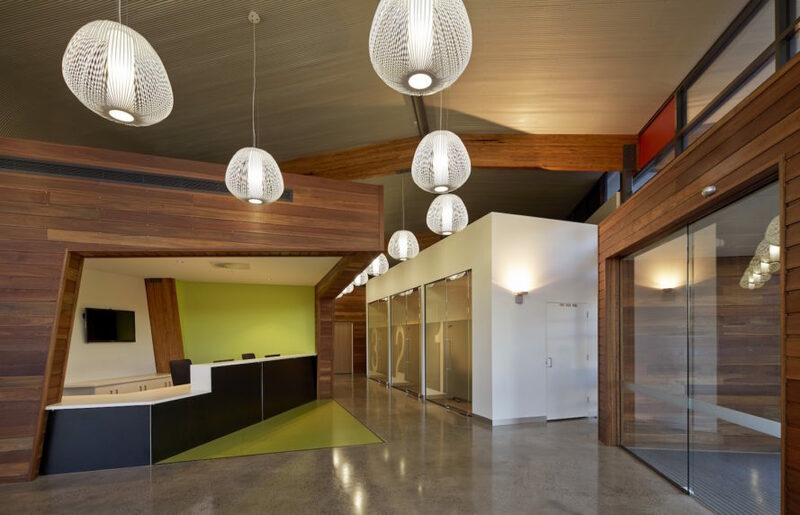 Since the Hindmarsh Shire Council Offices is located in a relatively remote rural location exposed to extreme temperature conditions, the building’s thermal performance was a high-priority design focus. To minimize heating and cooling costs, the building was constructed with an earth pipe heat exchange system and underfloor ventilation plenums to draw in fresh air that’s then cooled, or warmed, naturally by the earth and then distributed through the floor grills to maintain comfortable indoor temperatures. The silo-inspired buildings were constructed with a minimal and locally sourced material palette of Vic Ash timber, steel, and glass, as well as recycled materials from the former building, to reduce the project’s carbon footprint. The offices also incorporate 72 solar panels and LED lighting throughout. Passive solar design, cross-flow ventilation, and zoned motion detecting further minimize energy consumption.